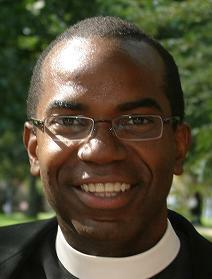 Michael Battle is Vice President and Associate Dean of Academic Affairs at Virginia Theological Seminary (Episcopal). Michael lived in residence with Archbishop Desmond Tutu in South Africa for two years, 1993–1994, and was ordained a priest in South Africa by Desmond Tutu in 1993. He has written out of his studies and friendship with Desmond Tutu, including such books as Reconciliation: The Ubuntu Theology of Desmond Tutu and The Wisdom of Desmond Tutu. He is also the author of Blessed Are the Peacemakers: A Christian Spirituality of Nonviolence; this book wrestles with how Christian practices of nonviolence are often neglected, and makes explicit connections between Mahatma Gandhi and Christian spirituality. In this essay I will attempt to do a strange thing: to begin practically and end theoretically. What I mean by practical is to sketch a description of our common seminary life. And what I mean by theoretical is to argue for why our common life cannot be separated from our academic life. So, I begin with the practical. The purpose of our common life at Virginia Theological Seminary is to increase our attention span for God and neighbor. One of my favorite Christian mystics, Simone Weil teaches communities like ours that the key to a Christian conception of studies is the realization that prayer consists of attention. She believes that prayer is the orientation of all the attention of which the soul is capable toward God. The quality of the attention counts for much in the quality of the prayer, but she cautions that this quality does not mature without a joy for learning. Without a desire and joy for learning, we cannot give our whole attention to God. Our intentional use of the common life through worship, classrooms, shared meals, and small groups always seeks how community reveals God. We have learned that communal practices are inseparable from theological vision. What I describe here is not meant to paint a picture of an insular community detached from most American universities and schools. In fact, our seminary seeks to be one of the best theological academic institutions in the world. What I do describe as community practices of integration are those regular events among us that continue to remind students, faculty, and staff why we are here and why we exist at all. This means that academic studies cannot be separated from all of the other formative experiences that are described in our seminary life. For example, the life of prayer conducted in our chapels or in small groups in faculty homes is also pedagogically linked to our rich academic attention to God in our classrooms and seminars. So, when a student prays for the people of Darfur in chapel, these same students are held accountable by their prayer in my class, “Jesus and Nonviolence,” to learn more deeply about the circumstances of Darfur. There is an inextricable link between what goes on in the classroom and what goes on in the rest of the life of our residential seminary. Students in our master and doctoral degree programs are reminded daily of Weil’s wisdom that prayer consists of attention as the rhythms of our seminary life cultivate a desire and joy for learning. The goals of writing a paper, understanding the meaning of the text, creating a Bible study in a prison, and even receiving a degree are not completed in themselves alone. There is always the greater need of paying attention to God through informal conversation or laughter at lunch, where a common language, even a shared humor, is formed. In short, our common life must never become “busy work” or a means to an end. Our being together is its own reward. We are mindful of this gift of time and space set aside for the cultivation of learning. We are especially reminded of this through the sacrifices of communities around the world who send students to Virginia Theological Seminary to do what most people in the world are not able to do: to be resident in an academic and spiritual community. Therefore, the responsibility is great for those who enter our programs — to remain mindful of the privilege of learning, not only for one’s personal gain, but for those communities who also depend on us to cultivate their joy of learning about God and our neighbor. The joy of learning that comes from our various communal practices helps us synthesize a tautology: we can only seek God if we already know God. We break this circular argument by depending upon others to know God and ourselves. After all, this is theological formation — that individuals are formed for ministry in community. To live in community, however, is not an easy endeavor. Such life requires change, tradition, and creativity — three forces that must be held together intentionally. For example, as part of our broader review of worship life at the seminary, one day I addressed the role of living outside of our comfort zone for both our leadership and personal roles in worship. Such openness would be needed to make sense of why a traditionally Protestant evangelical seminary was now adding daily Eucharists to its tradition of Morning Prayer. I spoke to our seminary community about living outside of our comfort zone for a season so that change, tradition, and creativity could become more than the sum of their parts. The essential question I tried to answer was: “How can our worship life together deepen, rather than contradict, our personal and corporate identity as the Protestant Episcopal Theological Seminary in Virginia?” The problematic issue, I assumed, in answering this question was the comfort zone of Western Christians — namely, personal spirituality. Communal spirituality beckons Western Christians like me to function at the edge of competency. Although I had been serving as the academic dean for less than a year, I tried to express a vision of community practices of integration to answer how our worship deepens our corporate and personal life together. European philosophers were the main constituents who tried to answer this question by discussing God as the object of our ideas. To his credit, Immanuel Kant was the pivotal thinker who questioned the possibility of our knowledge of any object, but he remained within the Western cosmology in which individual epistemology is dominant. In such a way of knowing, worship does not precede theology because an individual’s agency in knowing becomes primary. Worship, I argue, is another way of knowing communally. Without communal epistemology, we seem to be in a perpetual search for God at our own convenience, and often made in our own individual images. There are Western theologians who help us think through a deepened sense of worship and who challenge Western Christians out of their comfort zones of personal piety. Dietrich Bonhoeffer’s theology teaches that God is both being and action most clearly seen in the person of Jesus Christ. For Bonhoeffer, we cannot help but worship Jesus who constantly points away from himself and to others. Jesus’s nature is to be for the other. Bonhoeffer’s genius is that he constantly reminds us that we have a hard time with Jesus because we are constantly tempted to worship our individual selves instead of God. If we end up trapped in our own solipsistic forms of spirituality, however, we can no longer know God in the manner that God is known — namely, through others. We do not know God in the autonomy of an individual. Such an approach inevitably causes failure of knowing the presence of God. So, how does this all help us with the question: “How can our worship life together deepen, rather than stagnate, our personal and corporate identity?” In short, Bonhoeffer teaches us that worship is essential in knowing God. In fact, he teaches us that Christians know God essentially through worship. God is no object of our ideas that somehow statically rests out in space for us to think about. We can only know God’s being through God’s actions. And we can only make sense of God’s actions through worship. When we learn about what God has done through Christ, we cannot help but adore God — indeed, worship God. Worship is the way we know God. We deepen in worship because we are invited into the mystery of knowing God, who is not an object of our ideas, but the subject of our life together. We know God only through the relationality that Christ creates for us. Such relationality leads to two growing edges for Western Christians. First, we learn to pray in common. It is essential that we have common habits of worship, whether we feel like it or not, because it is through the mystery of the community’s worship that Christ is known. And second, through a good pneumatology, it can be argued that Christ exists among us as community. Theism cannot be anything but nonsense, if we are not allowed any sort of connection but either the accidental concomitance established by induction, or the formal implications between the terms of a language qua language. Farrer helps us see that we are not convinced of God’s presence simply by talking inductively or analytically about God. We must be somehow connected to God to know God. Just as a child imprints on a parent, knowledge is derived or discovered. A child will not know why her father is a theologian until she first realizes her relationship to him, and second, until the father discloses himself to his child. Similarly, only God can say who God is and that God is present with us in relationship. Bonhoeffer, Dietrich. Life Together and Prayerbook of the Bible. Minneapolis: Fortress Press, 1996. Farrer, Austin. Finite and Infinite: A Philosophical Essay. London: Westminster, 1943. Kant, Immanuel. Religion and Rational Theology. Cambridge: Cambridge University Press, 1996. Wainwright, Geoffrey. Doxology: The Praise of God in Worship, Doctrine and Life: A Systematic Theology. New York: Oxford University Press, 1980. Weil, Simone. “Reflections on the Right Use of School Studies with a View to the Love of God.” In The Simone Weil Reader, edited by George Panichas. Mt. Kisco, NY: Moyer Bell Publishers, 1997.